Timeline - panel 1. Depicting the woolly mammoth and a clay pot made by the Beaker people who lived on Holyhead Mountain 3000 years ago. Elements of air, water and fire stream through the design along a bronze timeline. Border of geometric abstract black and white. Timeline - panel 2. Depicting the Llyn Cerrig Bach celtic triskele crescent plaque. Roman helmet. Elements of air, water and fire stream through the design along a bronze timeline. Border of Druidic oak leaf. Timeline - panel 3. Depicting the maritime history and industry, Holyhead breakwater and lighthouse. Elements of air, water and fire stream through the design along a bronze timeline. Border of tidal waves. Timeline - panel 4. Depicting the "Wild" family Brickworks, B52 Liberator WWII Bomber which had crashed off the coast. Elements of air, water and fire stream through the design along a bronze timeline. Border of stylised railway line..
Timeline - panel 5. Depicting the HSS Ferry to Ireland, Peregrone falcon, Oyster Catcher, a family of visitors walking their dog, coastal cliffs with Thrift. . Elements of air, water and fire stream through the design along a bronze timeline. Border of Isle of Anglesey County Council logo colours. Mosaic of the Crucifixion at Our Lady of the Rosary Catholic Church, Buckley, North Wales. Matt porcelain tile, smalti on fibreglass mesh, cement fixed in situ onto block wall. Approximately 10ft. x 8ft. Mosaic in panels ready for installation. My interpretation for an exhibition themed 'Leading Light' . In an age when women had no civil rights and little power over their own lives, Queen Elizabeth I was the most powerful person of her time. She is my vision of a leading light. Approx. 36ins x 48ins. Stained glass, vitreous glass, recycled china crockery, ceramic and glass beads on board. "The Betrayal of Christ." My copy of a small section of a mosaic in the church of St. Apollinaire Nuovo in Ravenna, built in the 1st century AD. Italian smalti fixed into lime mortar. Approx. 9ins x 15ins. Commission for a public house in London. This is my interpretation of the "Green Man," primarily a symbol of rebirth, or "renaissance," representing the cycle of growth being reborn anew each spring. Recycled ceramic, china, porcelain and glass beads on board. Mahogany edging. Approx. 36ins. x 24 ins. Paned efo Nain (Welsh: "tea with Grandma") is my interpretation of work for an exhibition themed "Welsh Memories" . Growing up in Wales, Sunday afternoons were spent at Nain's house. Nain's best china would come out of the cupboard, with paper doilies, sugar cubes and silver tongs and we children would eat mounds of Welsh tea bread "bara brith" and best butter. Recycled blue and white china, ceramic tile on board. Pip celebrates his 100th birthday. 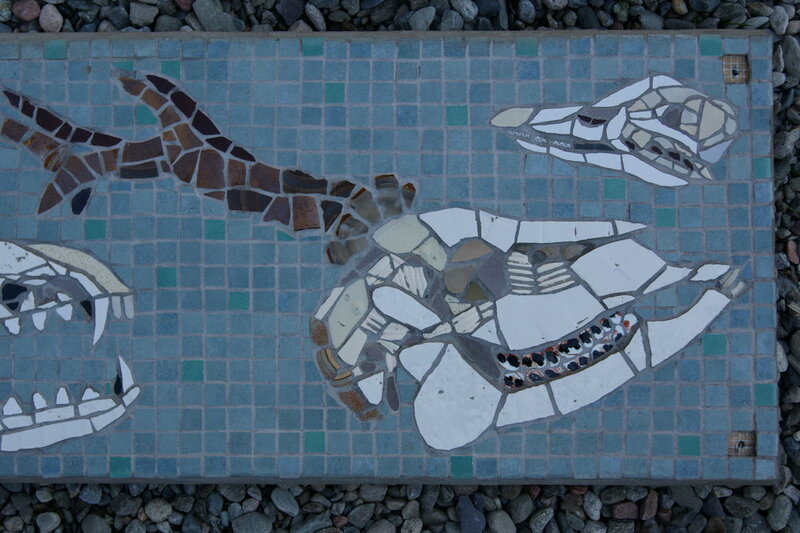 Mosaic commission of "Pip" to celebrate his 100th birthday. Italian smalti, ungrouted, set into lime plaster on board. Approx 15ins x 13ins. “Ferrari” badge. Vitreous glass on board. Approx. 15-1/2 ins. x 17-1/4 ins. FOR SALE please go to Contact page. Section of the "Biodiversity" mosaic at Wyre Forest, Bewdley. Insects. Recycled ceramic tile and crockery, vitreous glass, glass beads. "Biodoversity" mosaic at the Wyre Forest Visitors Centre, Bewdley. Insects panel in the Wyre Forest "Biodiversity" mosaic. Detail. Insects panel in the Wyre Forest “Biodiversity” mosaic. Detail. "Biodiversity" mosaic at Wyre Forest, Bewdley. Feathers. Detail. Leaves of the forest. Materials used are vitreous glass, recycled china crockery, ceramic. "Biodiversity" mosaic at the Wyre Forest Visitor Centre, Bewdley, Worcestershire. Skulls of various animals and birds inhabiting the forest. Recycled china crockery and ceramic. Section of the "Biodiversity" mosaic at Wyre Forest, Bewdley. Skulls. Recycled ceramic tile and crockery. Tree of Life. My favourite tree is the oak. Oak leaves abound through my mosaic work. Here an acorn represents a child of the family, with each acorn pointing in his or her own direction for life. Prestatyn Roman Bathhouse, North Wales. Mosaic depicting symbols of the Roman 20th Legion stationed in Prestatyn. Part of the Merseyside Connections History Trail built in 2008 to celebrate Liverpool's Cultural Capital status. Granite, ceramic tile on a stone plinth. "Hen Wlad Fy Nhadau" (Welsh National Anthem) for an exhibition in London themed "Musica". Welsh slate, vitreous glass, recycled china, 24ct. gold smalti, ceramic, glass. Approx. 2ft. x 18ins. "Al Hubb" (Arabic "Love") The road to finding love is often rocky and filled with obstacles large and small but once found it shines golden. Materials are recycled china, ceramic, vitreous glass, granite, marble, 24ct. gold leaf smalti on board. Japanese "Love". The road to finding love is often long and unreachable with many setbacks and pitfalls enroute... Mosaic measures approximately 10ins. x 15ins. and is made of recycled crockery, vitreous glass, Roman marble, 24ct. gold leaf smalti, glass and ceramic. Mosaic materials: Italian enamelled glass smalti, ungrouted. One of a series of "Yes, ..." mosaics to encourage the viewer to consider that anything is possible, anything you set your mind to. Ceramic tile, recycled gold glazed china, smalti. Bathroom wall mosaic of a family tree. Within the white mosaic background in "opus palladianum" lies the initials of each family member... China cup handles and porcelain plate rims add a sense of dimension and curiosity to the mosaic. Garden slab mosaics. Design of Roman guilloche knots and Roman numerals. 20 ins. sq. Built in the indirect method, materials used are ceramic and marble, embedded into a cement base. Garden slab of the “Manchester Bee”. Quarter step of a turned staircase at Sheldrakes Restaurant, Heswall, Wirral. The design tries to imitate the beauty of the everchanging colours of the shoreline of the Dee Estuary on the banks of which the restaurant is situated, and the setting of the sun. Gold smalti, matt porcelain tile, gold leaf glass tile. Approx. 48ins. x 42ins. Celtic Triskele design drop-in tabletop on wrought iron base. Ceramic tile on board. Approx. 25 ins. x 18 ins. Celtic knot design circular table top with hand wrought iron base and edge. Ceramic on board. Approx. 21 ins. diameter. Celtic knot design table top. Commission. Antique teapot ceiling mosaic. This mosaic was built using recycled antique china and porcelain teapots fixed upside down onto the ceiling with a recycled china plate background ceiling rose and central light fixing. I was reminded of my love of the story of Alice in Wonderland as a little girl. Approx. 45ins. x 36 ins. Cracked antique teapots have been given a new lease on life. Private commission for a conservatory door step in North Wales. "Croeso" (Welsh welcome). Welsh slate, marble, ceramic. Approx. 48ins. x 22 ins. Wall installation for a conservatory water feature. Mixed ceramic and glass, Welsh slate, vitreous glass, smalti on Hardibacker board screw fixed onto brick wall. Floral Flower. An experiment with soft pastel coloured broken ceramic and china, and mirror. Rose-patterned china and porcelain become a stylised lily. Approx. 20 ins. x 18ins. Grim Mask. Inspiration for this mosaic came from an ancient oak door carved with "Comedy and Tragedy" theatrical masks. The door is to be found at Plas Newydd (www.llangollen.com/ gallery/1.jpg), the home of the Ladies of Llangollen in North Wales. Recycled china and porcelain, ceramic,glass beads. A series of mosaics in a collection of winter scenes at Wepre Park, Connah’s Quay, North Wales during a residency for Flintshire County Council. Floral Carving. 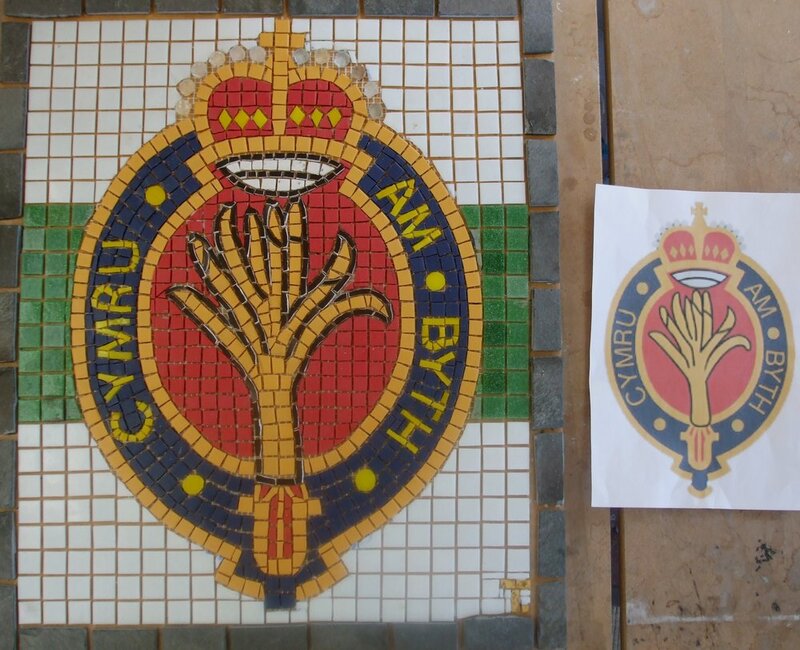 Inspiration for this mosaic came from the ancient oak carvings at Plas Newydd (www.llangollen.com/gallery), the home of the Ladies of Llangollen in North Wales. Vitreous glass, recycled china and porcelain, ceramic. Approx. 12 ins. x 9ins. Aga splashback. "Jones" family crest with an adaptation of the motto to read "AUDEO DEFICERE" or "dare to fail". Matt porcelain, gold glass, recycled gems, ceramic. 32ins. x 57ins. Kitchen cupboard door mosaic inset. Kitchen floor mosaic inset with Celtic knot and Fleur de Lys. Where a partition wall was removed a mosaic inset is the perfect solution to seamlessly join the two floor areas. Matt porcelain Mazurka and Winklemans tiles.